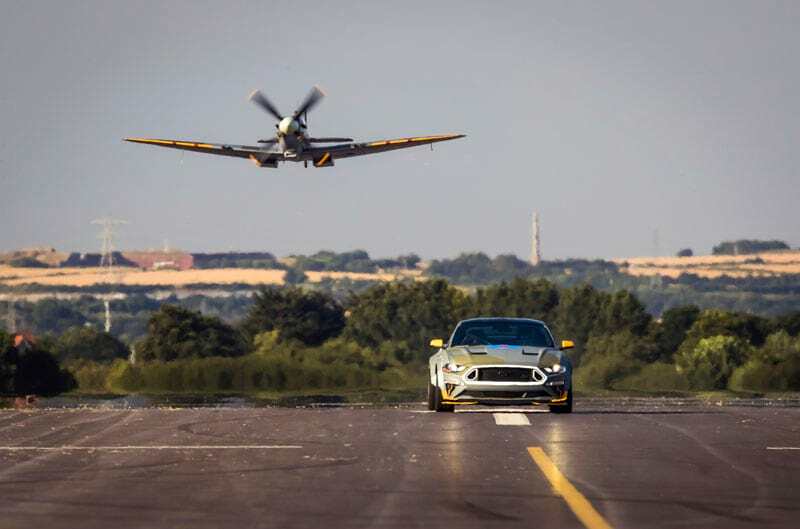 The very special, one-off “Eagle Squadron” Ford Mustang GT formed out of a partnership between Ford Performance and Vaughn Gittin Jr.’s RTR Vehicles is preparing to tackle the 1.16-mile Goodwood Hillclimb at the 2018 Goodwood Festival of Speed, and we can’t wait to see it fly. 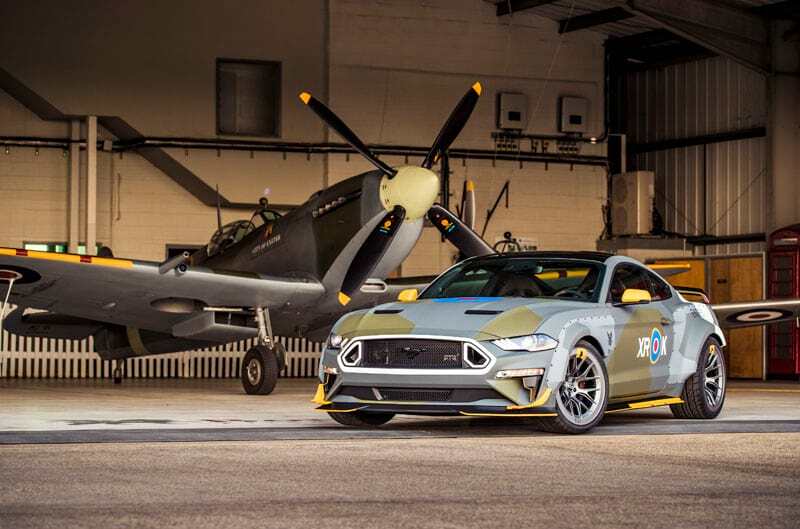 The camouflage-patterned custom Mustang was built to raise money at auction for the Experimental Aircraft Association’s youth educational programs, and planned as an homage to the Royal Air Force’s 100-year anniversary. The Eagle Squadrons were a group of three squadrons within the RAF during WWII, comprised of volunteer US pilots back before the US had entered the war. For an automaker like Ford, which played a crucial role in producing planes and other arsenal for the US war effort, it’s an issue close to the heart. The Ford Performance/RTR Vehicles Eagle Squadron Mustang GT is powered by the same advanced, 5.0-liter Coyote V8 that powers the standard road car, albeit bolstered by a Ford Performance supercharger capable of providing up to 12 psi of boost for 700 horsepower of thrust. A Tremec six-speed manual with Ford Performance short-shifter sends all that power to the rear wheels through an upgraded Ford Performance heavy-duty axle. With great power comes great responsibility, and to better handle all the extra grunt, the Eagle Squadron Mustang GT has been given adjustable MagneRide dampers with Ford Performance lowering springs, and adjustable RTR sway bars control roll at the front and rear. The wheels are of the staggered RTR Aero 7 variety, featuring two-piece forged construction, wrapped in 285/30-ZR20 front and 305/30-ZR20 rear Nitto NT555 rubber. Inside, the one-off Mustang boasts a custom leather interior with Recaro racing seats embroidered with an Eagle Squadron logo. The shift knob, which is constructed of metal from an actual F-35 Lightning, also features a hand-engraved Eagle Squadron logo, and on the dash is a hand-engraved badge made from aluminum donated by a real, genuine Supermarine Spitfitre.